Community Meeting in Hartley regarding the Hy-Tech Austen Quarry proposed extension of its operating life. 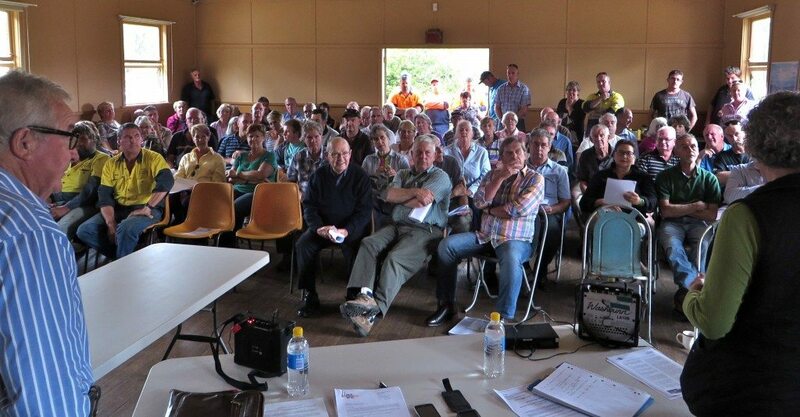 Saturday 29th March, 2014 saw more than sixty people attend the public meeting to hear details of the Hy-tec quarry expansion proposal. At the meeting the Hytec Manager Darryl Theidike, National Planning and Development manager outlined the proposal, following which Darryl and General Manager Ian Boxall answered questions from the audience. Questions ranged widely from concern about river pollution, traffic noise and hours of operation. A suggestion by one attendee that the quarry should access the Highway via a private road through Hartley Pastoral company lands was popularly acclaimed but was said to be unacceptable to the RMS. The meeting concluded with a commitment by Hy-tec that once their Environmental Impact Statement is completed they will return for a further meeting later in the year (probably August) where they will review the detail of their EIS with the community . Details will be announced on the HDPA website once the date is settled. This hard rock quarry is located at Hartley in the Blue Mountains, approximately 100km from west of Sydney comprises the latest state of the art equipment on primary, secondary and tertiary operations delivering dependable quality products. A durable igneous rock classified as Rhyolite which has a fine grained grey / brown to bluish colour consisting of angular to roughly cubical shaped particles with a rugged surface texture. Decomposed granite (brown only), this decorative gravel is available screened or unscreened and most commonly used for driveways and footpaths. In order that the Hartley and District Community have an opportunity to meet with Management of the Quarry enterprise to be briefed on this proposal, a PUBLIC MEETING will be held at the Community Hall, Mid Hartley Road, Hartley, timed for 2pm on Saturday, 29th March 2014. Operators of the Quarry situated on Austen family property via Jenolan Caves Road, Hartley are Hy-Tec Industries Pty. Ltd. They will be represented at the Meeting by MR DARRYL THIEDEKE, National Planning and Development Manager, Hy-Tec Pty. Ltd. And MR ROB CORKERY, principal of R. W. Corkery & Co. Pty. Ltd., who are the Geological and Environmental Consultants for the project. The history of the Quarry will be well known to most of the local community but for those not so familiar this meeting provides an opportunity to be better informed of its significance. We encourage the participation of our Community to feel free to comment on any aspect and to ask questions. Hi-Tec are in the process of preparing the draft EIS which will be sent to the Department of Planning and other Government Agencies for adequate assessment. Your comments and considerations are important to the process, it follows then your contribution at the meeting is an important step in the process. LITHGOW Council could again be on the way to the Land and Environment Appeals Court after unanimously rejecting a bid to modify the conditions governing operations at the Hartley Rhyolite Quarry. At issue are hours of operation and the movement of quarry trucks along the Jenolan Caves Road to the Great Western Highway. The operators had applied to Council to operate from 5 am to 10 pm, attracting a hostile reaction from residents in the area from Good Forest through to Glenroy. Blue Mountains Council had also opposed the changes. The company had argued the earlier start was required to allow its trucks to reach delivery points in Sydney before the peak morning traffic build up. Following submissions from all parties late last year Council deferred decision to allow an on site meeting and the outcome was reported back to the latest general meeting of Council. Regional Services Group Manager Andrew Muir said the issues raised involved speed limits along the Caves Road, the safety of traffic on the Glenroy Bridge during the early hours, particularly on icy Winter mornings, and the noise from the trucks. There is a popular holiday site adjacent to the bridge. Mr Muir said a decision of the meeting was for a submission to the RTA seeking a speed limit reduced from 80 to 40 km/h for trucks and buses from the quarry entrance to the highway intersection. The meeting also voiced opposition to the extended hours of operation but company representatives said the 5 am proposed starting time was not negotiable. They were prepared to consider a closing time of 9 pm instead of 10 pm. Mr Muir said that when the quarry was approved back in 1994 the hours of operation were to be 6 am to 6 pm Monday to Friday and 6 am to 3 pm on Saturdays. He said that in the latest concerns over noise the problem was exacerbated by the exhaust brakes on the trucks approaching the Glenroy Bridge over the Coxs River. He said that up until now there have been no complaints about the hours of operation of the quarry. Mr Muir recommended the application be approved, with a submission to the RTA for the 40 km/h speed limit. But Councillors were not impressed. Led by a motion by Crs Howard Fisher and Joe McGinnes they unanimously decided the hours of operation should remain the same. “I don’t believe residents should be subjected to semi trailers coming and going from 5 am to 9 pm,” he said. He said if the change was approved the trucks would actually be arriving from around 4.30 am. Council, he said, should learn from the experiences with truck movements from the Cullen Valley coal mine. Similar concerns about early starts were expressed by other Councillors including Cr Ray Thompson who said residents had ‘legitimate concerns’. Cr Martin Ticehurst said the applicant had described the proposed changes as ‘minor’ but ‘I wonder why he wants increased times when he says the change would reduce traffic movements’. Mr Muir: The number of truck movements is capped by the RTA. Cr Ticehurst: And who monitors that?